Movies are always showing us the future of the planet,intent on showing us a landscape that would otherwise be left up to our imaginations. What would the Earth be like after an alien invasion? What does Armageddon look like? It’s usually intriguing to watch a filmmaker’s interpretation. The problem is, it’s starting to feel like we’ve seen it all. In OBLIVION we are to believe Earth has gone to war with our galactic foes – Scavs. During this war the Scavs destroy Earth’s moon, which hurls the Earth into chaos (earthquakes, floods, more). Earthlings sacrificed almost everything to ensure victory, but we won. The Statue of Liberty is crumbled and hardly recognizable. There's hardly any sign of plant-life, and the planet looks like a white desert. The landscape and sets are beautiful and dramatic, but the script can’t quite live up to them. The movie picks up in 2077 at a time when the Earth can no longer sustain human life and Earthlings have relocated to Titan, a moon of Saturn. The main characters have been left behind to keep up maintenance on Earth (think live-action WALL-E). This includes upkeep on roving drones, which help defend the planet from the remaining group of Scavs and other risks. These keepers of the Earth are Jack Harper (Tom Cruise) and Victoria (Andrea Riseborough) – co-workers as well as lovers. They take their orders from a command station called the Tet. Aboard the Tet is the commander of their mission, Sally (Melissa Leo). In classic Tom Cruise fashion, Jack has trouble following orders as he maintains the Earth and defends it from remaining Scavs. As simple as it sounds, the first act of the movie is the strongest. The focus is sharp and shows us a planet full of mystery and the unknown. Perhaps the film's best element is its imagery. Director Joseph Kosinski is coming off a strong visual effort in TRON: LEGACY and continues it here. Isn’t that what it’s all about, showing us something we haven’t seen before? Soon enough, though, the movie caves to the pressure of throwing in twists and turns, ultimately showing us a movie we’ve seen before. 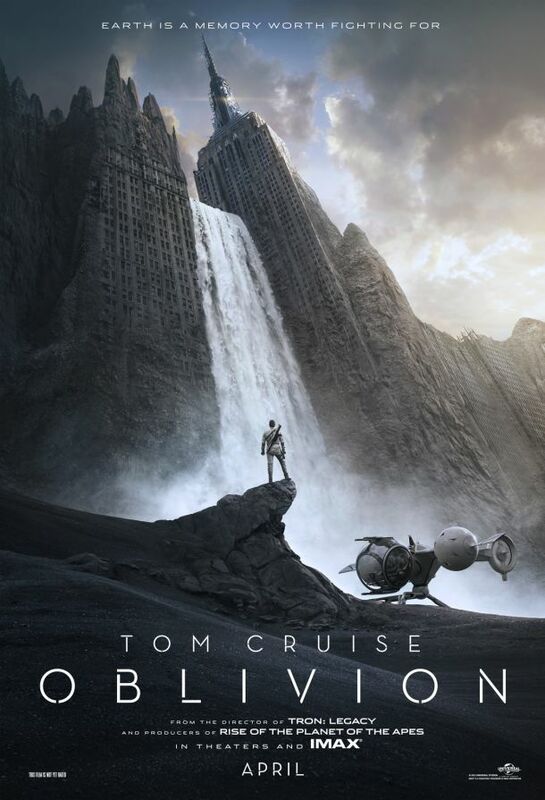 OBLIVION is a “nothings as it seems” film and, as it turns out for the audience, an all too predictable one. Jack questions his reality and [continues] to question the authority. As he discovers more about the planets and the Scavs and as the story builds, it loses some focus. Morgan Freeman appears halfway through the film and helps anchor the movie as it begins to ask a little more of you. However, Freeman’s role is not review friendly (no spoilers here). Tom Cruise is still working on a career of playing cool with an edge, the bad boy who just doesn’t care to follow the rules. He shows he has it down pat and has no intentions of expanding upon it, but it's so old hat now with Cruise that it doesn’t do much to make us care about Jack. Even the reliable Freeman seems to give just enough to pass here. This film probably had some great potential, as it must have made a great sales pitch to the studio, but it just didn’t go anywhere like it could have. Good review Joseph.